Here are my fifth grade students finishing up their global influences self-portrait drawings. 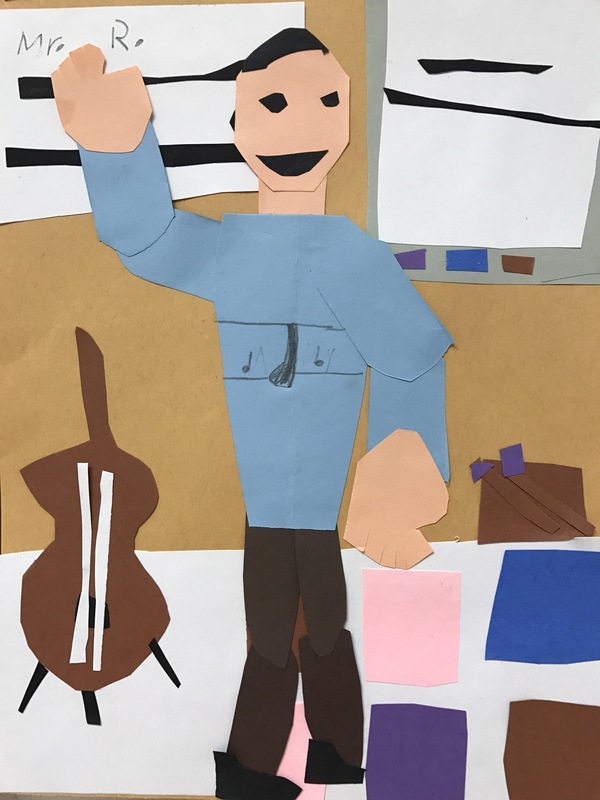 On the last day of this unit, some students are working to complete their self portrait drawings, while others who have already finished using iPads to photograph their finished work and upload to Google Drive, while others are logging into Google Classroom via laptop to submit their completed work and complete their artist statements. 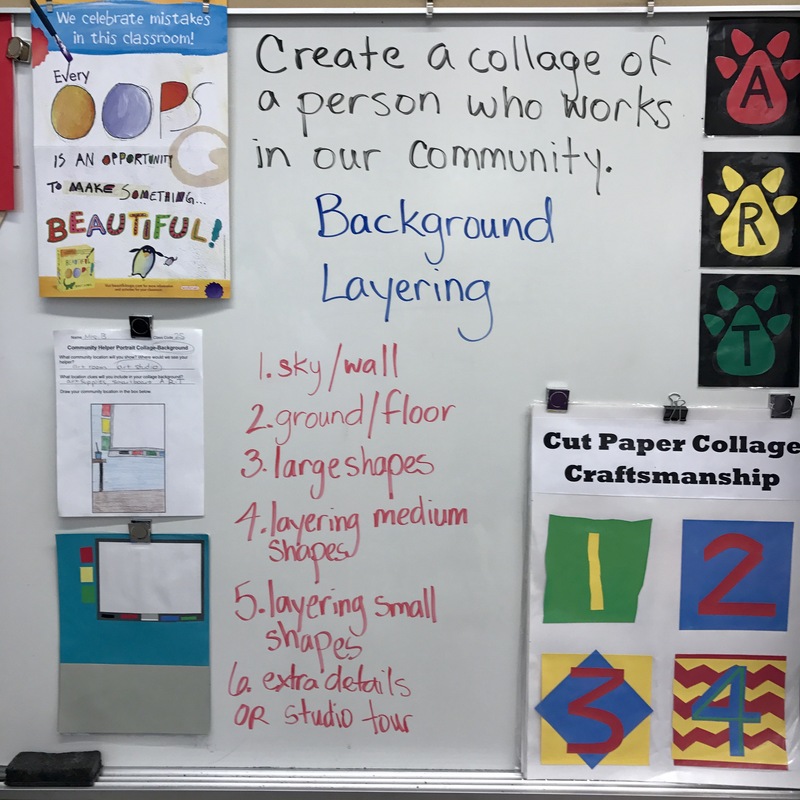 I originally saw this idea on NCHS Art-Elmore, Ms. Brown’s Art, Lessons from the K-12 Art Room. I thought this would be a great fit for my fifth graders as an introduction to our grade level big idea of Globalization. 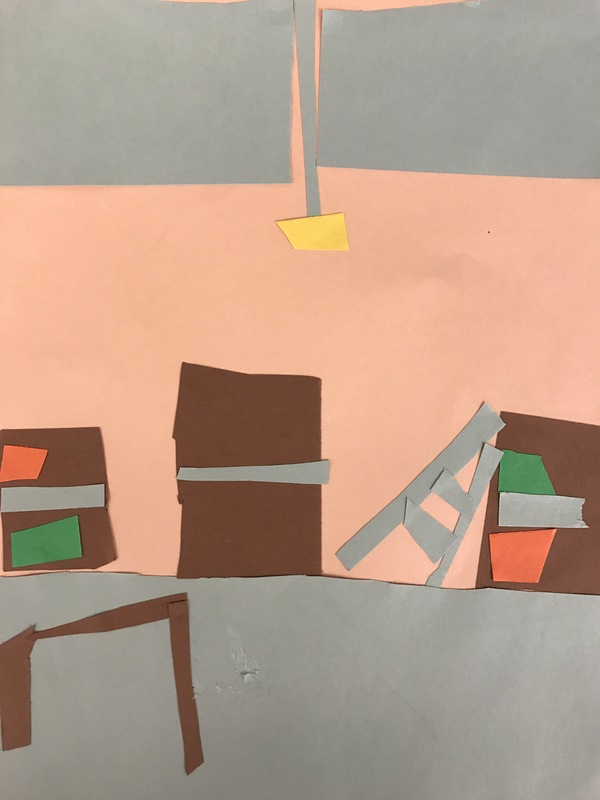 We spent some time talking about where artists get their inspiration, and how artists symbolize these influences in their work. We viewed and discussed artwork by Giuseppe Arcimboldo and Octavio Ocampo, as well as contemporary artists Nikki Rosatto, and Pat Perry. 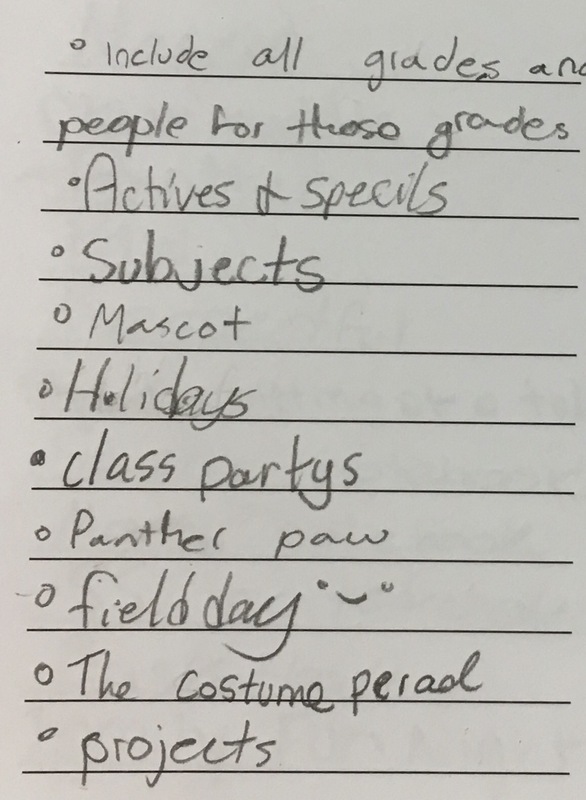 Students brainstormed categories of influence, selected five categories that were relevant to themselves, then sketched objects or ideas that fit into each of their personally selected categories. Next I photographed students in profile so that they could trace their basic profile outline from a photograph printed in black and white on 11×17 paper on the copier. I also demonstrate a variety of marker drawing techniques including layering colors, hatching, crosshatching, and stippling to create value. 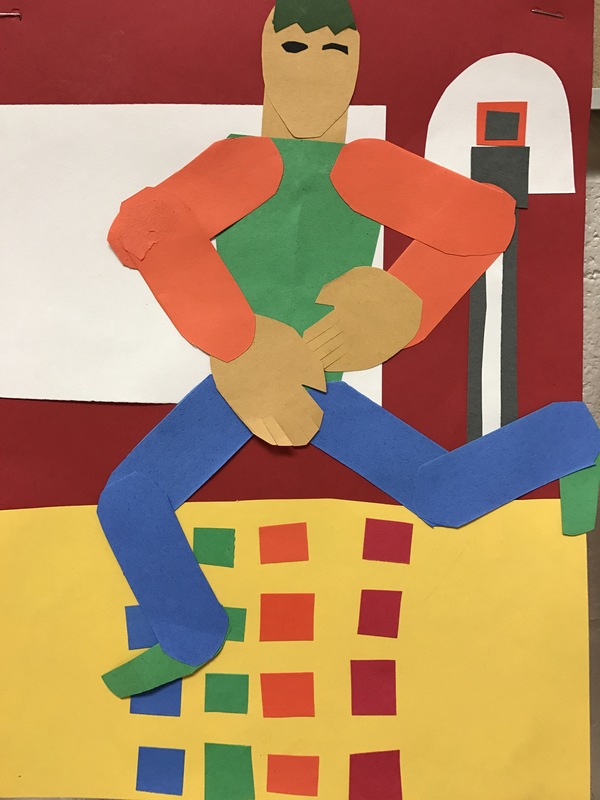 Students worked on their drawings for three one-hour class periods. 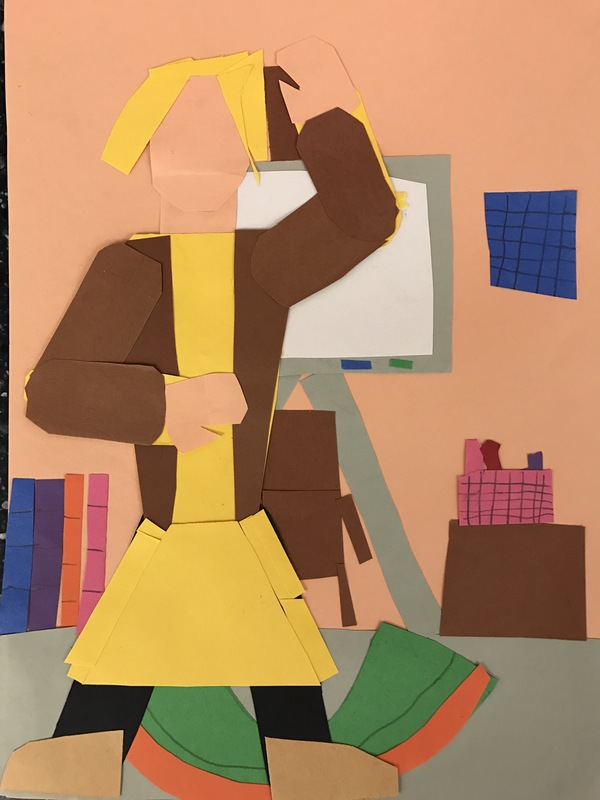 Some of my favorite solutions to this artmaking challenge included students who chose an original profile pose that added to the expressive quality of their drawing, revealing even more about their personalities than the more traditional silhouette poses. 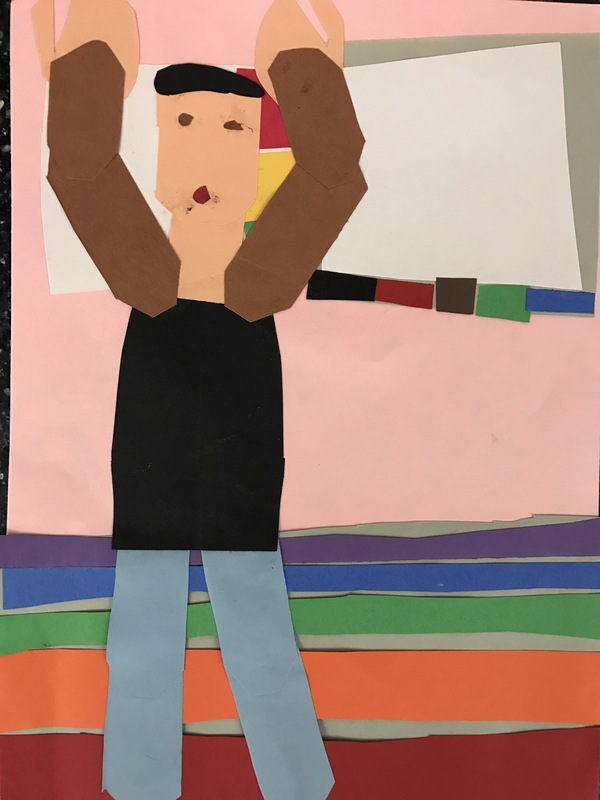 I love that this lesson gives students the framework and confidence to create a self portrait drawing while leaving room for students to express themselves in original ways. 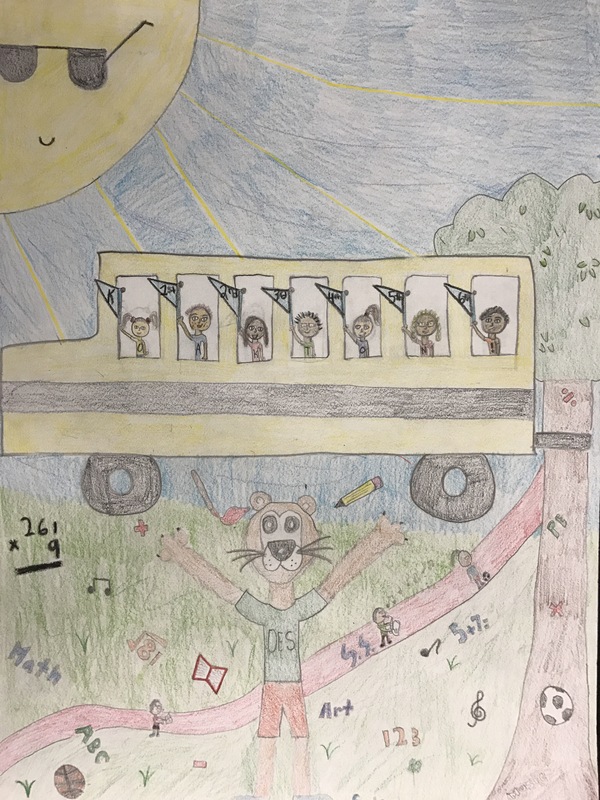 Each of the drawings turns out unique and is a great illustration of the student who created it. 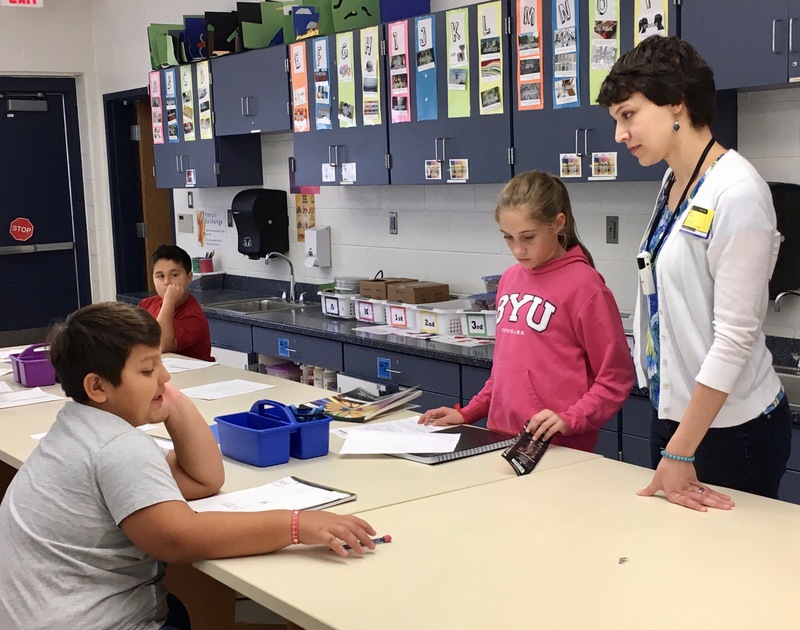 In project-based learning, students are presented with a guiding question that initiates the inquiry process. 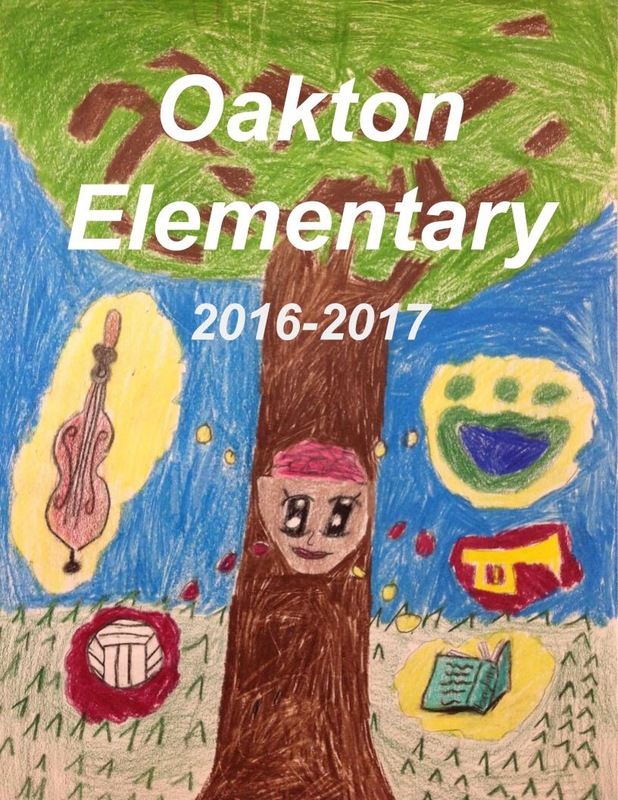 Each year my sixth graders are challenged with designing an original yearbook cover design. This year I presented this lesson using the project-based learning framework. 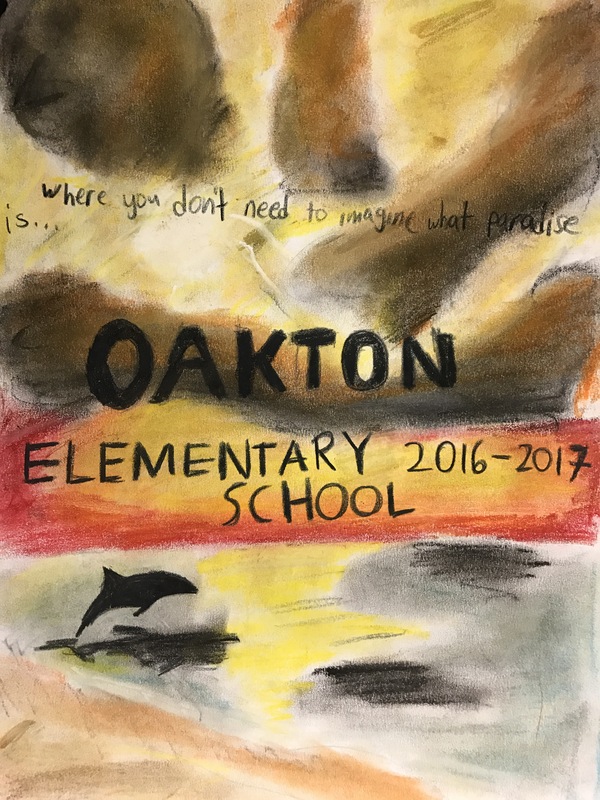 Students were asked how they could, as graphic designers, design an original yearbook cover that represents the collective identity of Oakton Elementary students. 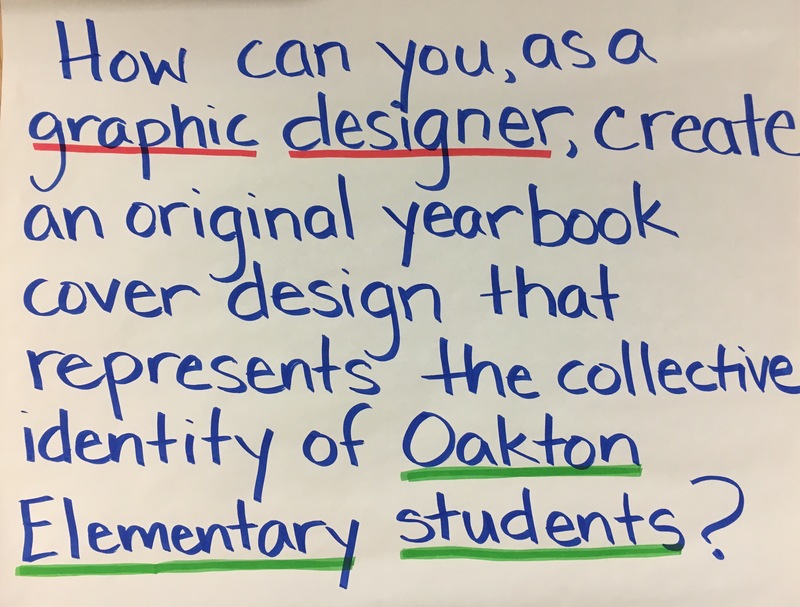 Next, students generated a list of Need to Knows that included things like: What is a graphic designer? What materials can we use? 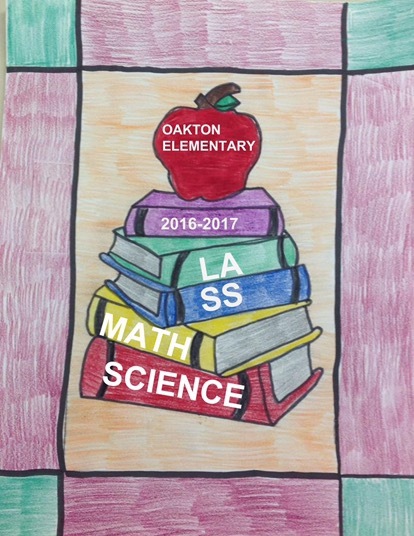 How do we represent Oakton students? What size is the design? 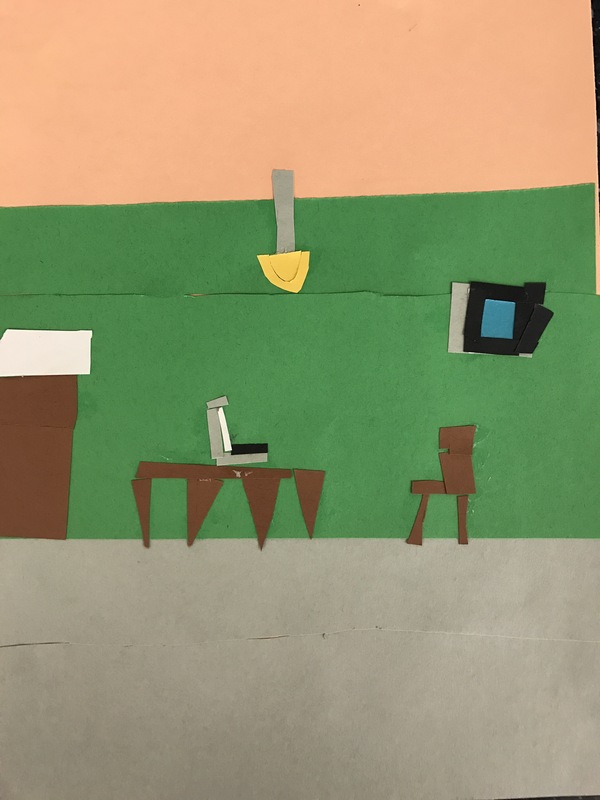 How will we use the computer while creating our designs? These questions guided us through the rest of the project. 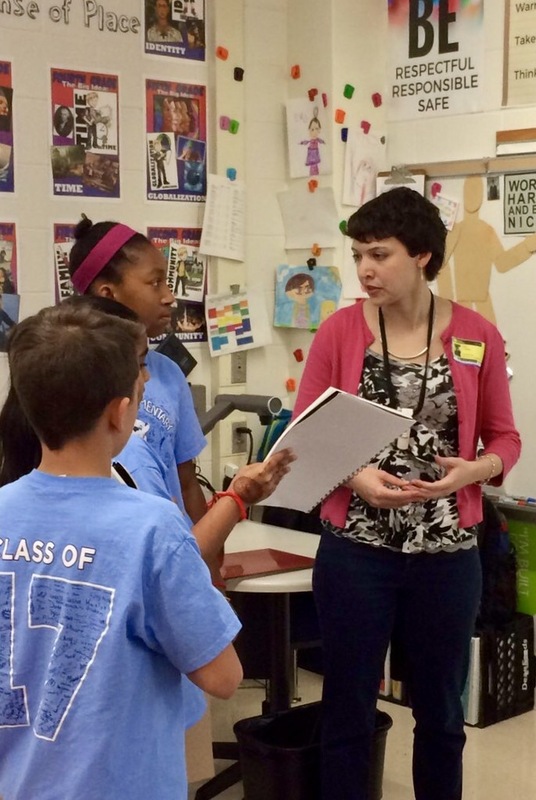 Each week I delivered instruction that addressed the Need to Knows that the students had created. 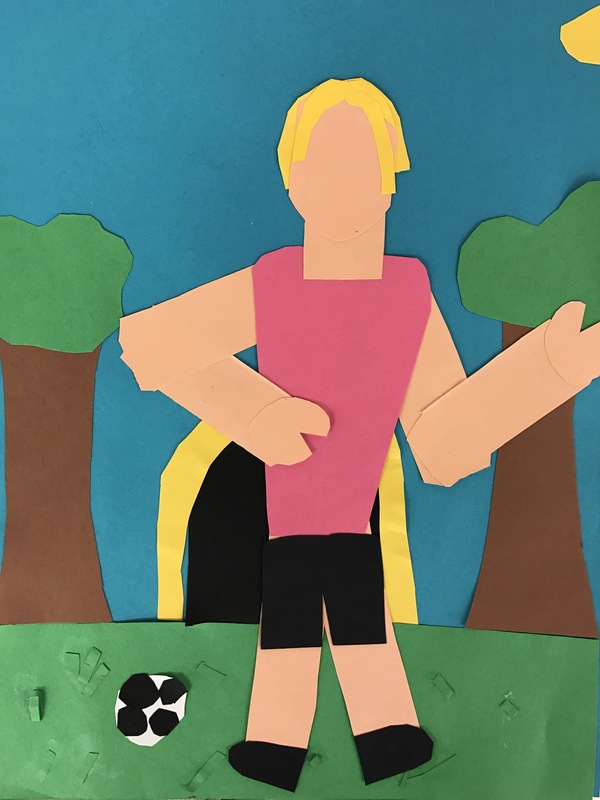 I provided basic information regarding the basic requirements for the assignment such as size, media, and deadlines, but the specific content and imagery was left up to my students to generate, within the framework of the challenge. 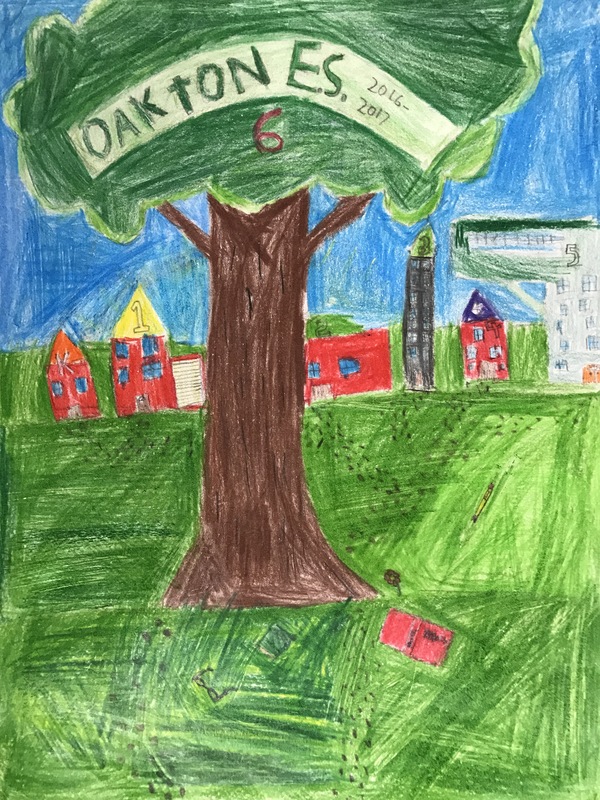 Since our yearbook cover needs to represent our school as a whole, collective student identity was a seamless fit with our grade level big idea of Identity. 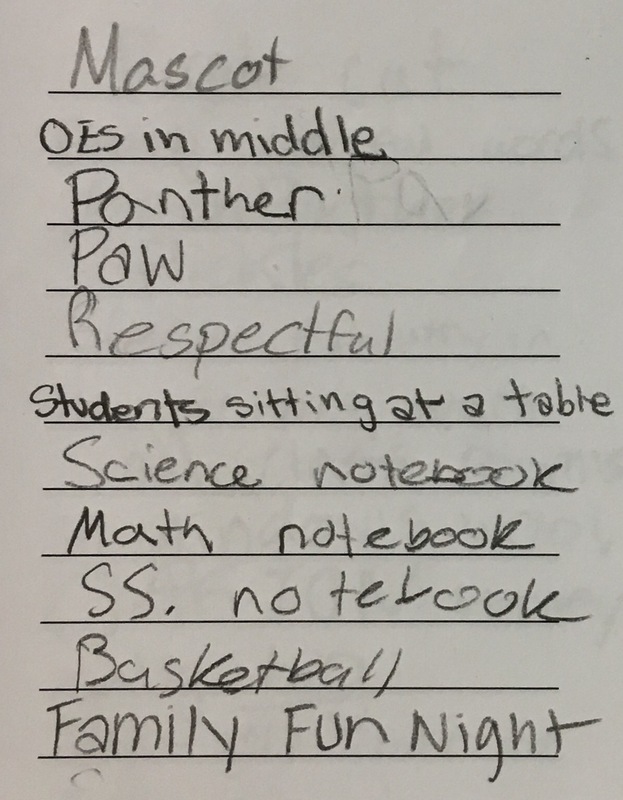 During a round robin brainstorming session, students collaborated to generate lists of ideas that represent our school. 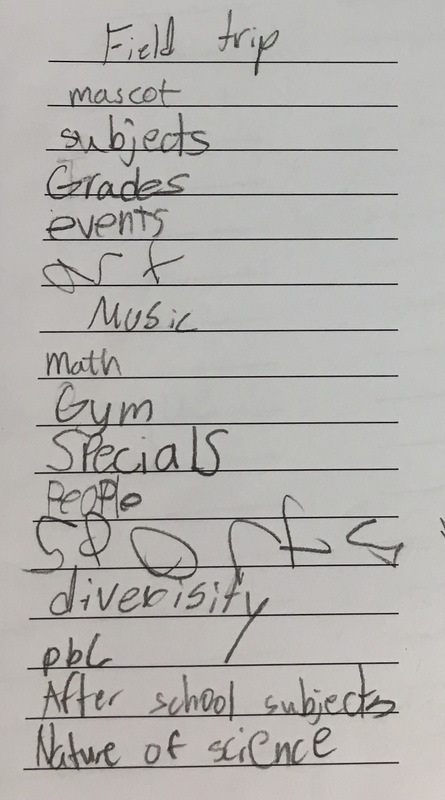 I collected all of these ideas and used them to create a Wordle that illustrated our most common ideas, and we discussed the importance of selecting ideas that were recognizeable symbols for our school. We also discussed the potential of using less obvious ideas to create more original responses to the challenge. The following week I invited a guest artist to talk to my students about graphic design. 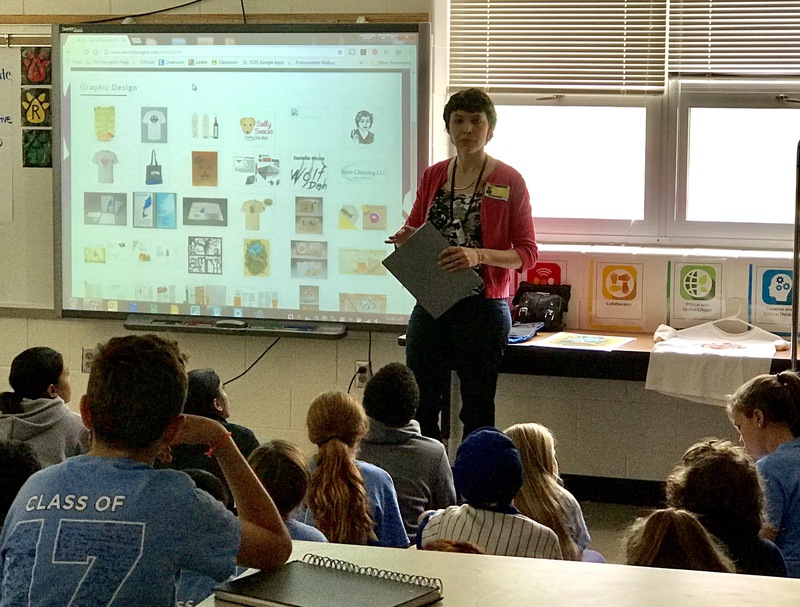 Our visiting artist Anna Dunn taught students the definition of graphic design, shared her portfolio of work, and participated in a Q & A session where students had the opportunity to ask questions that helped them understand their own roles as graphic designers more clearly. 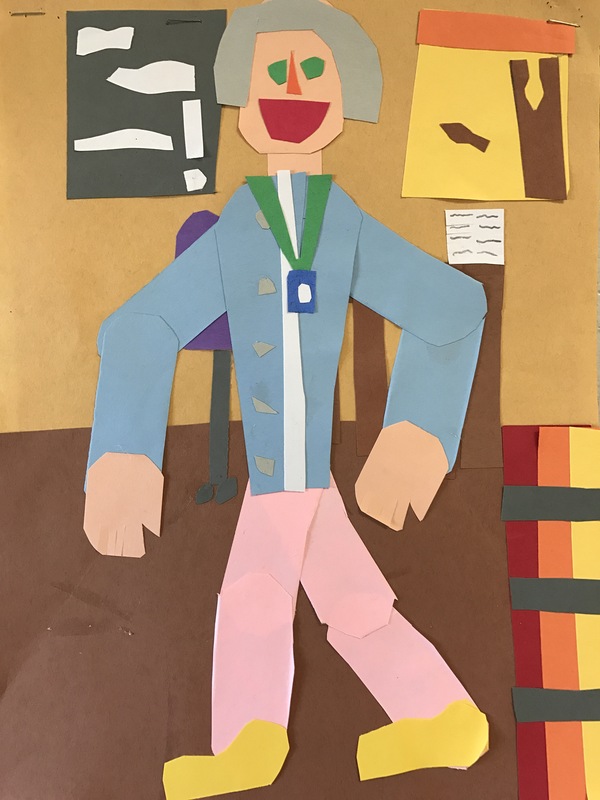 While I could have taught a lesson on graphic design myself, having a “real artist” instead of your art teacher talk about the design process was much more engaging and meaningful to my students. 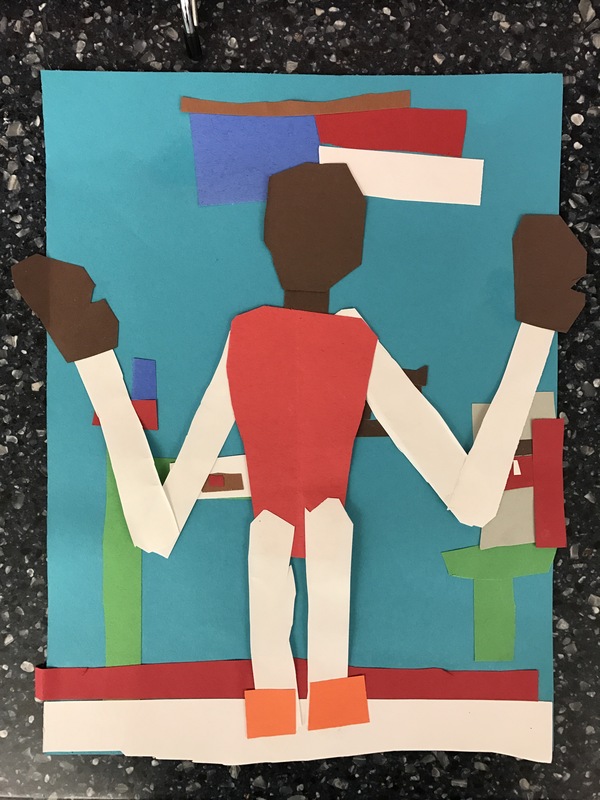 Mrs. Dunn confirmed all that I have taught my students about creating thumbnail sketches, making revisions, and refining ideas throughout the artmaking process. 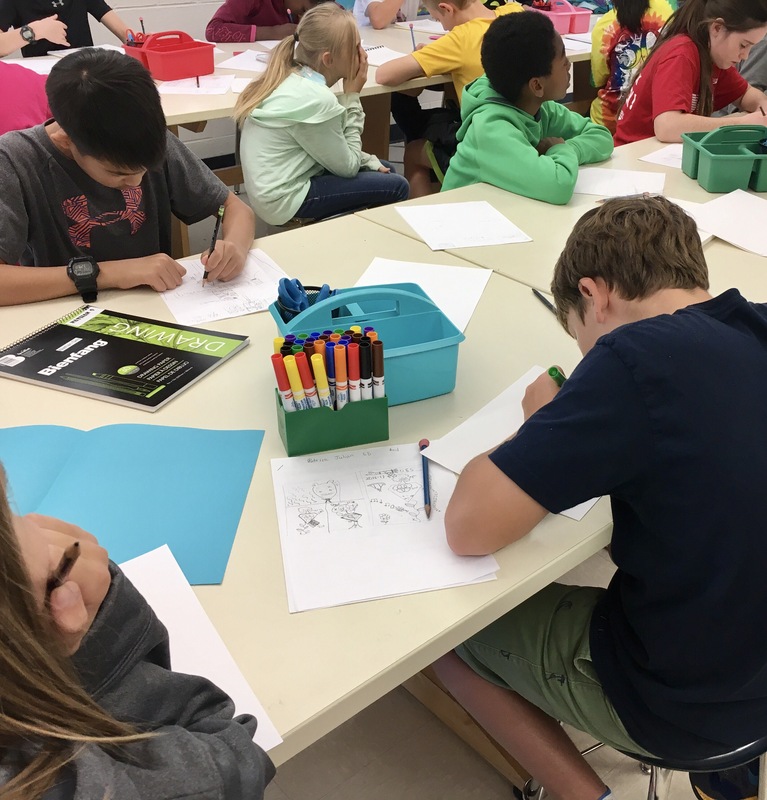 Student buy-in was higher this year than I have seen in the past, and students were eager to start sketching and working on their final designs. 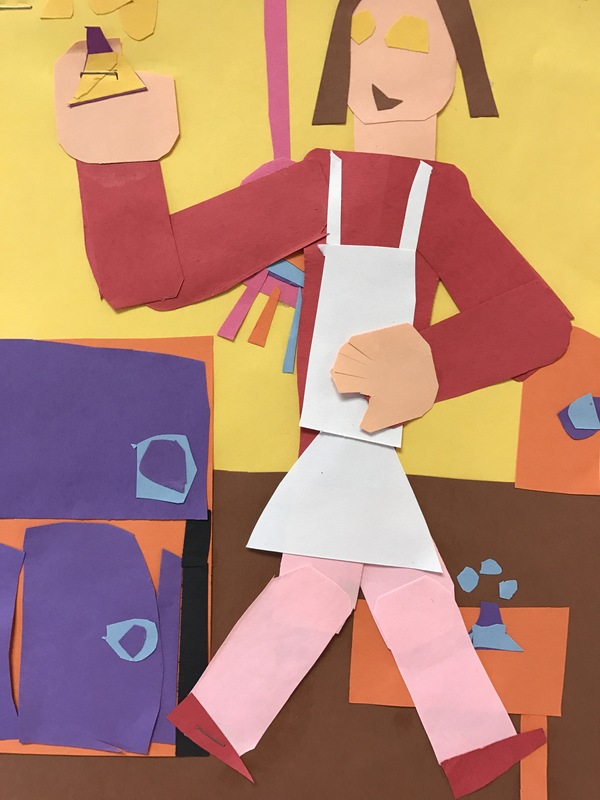 While students worked on their thumbnail sketches, Mrs. Dunn consulted with students on their thumbnail sketches, encouraging students to develop more than one thumbnail, and providing critiques that assisted with final revisions. 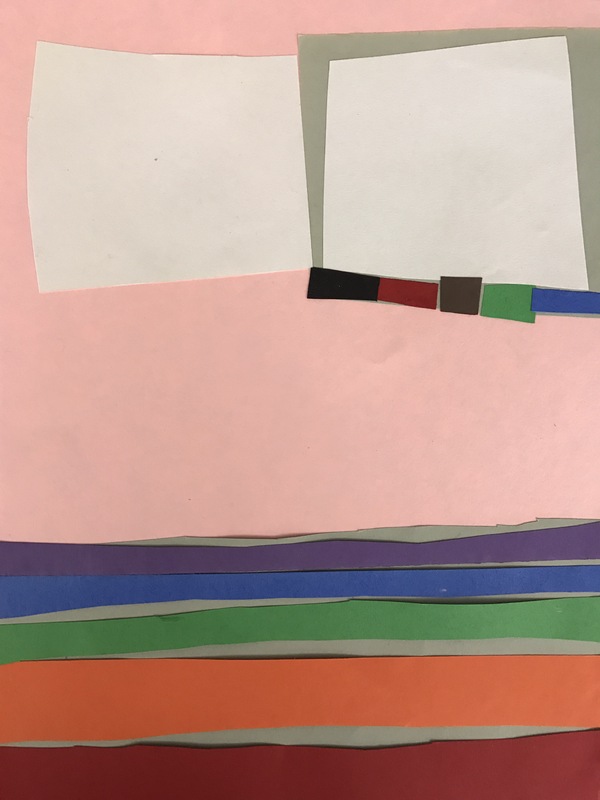 Students had the choice of two-dimensional materials including colored pencil, crayon, markers, and cut paper. I encouraged students to choose the media they felt was their strongest, or the one with which they felt most comfortable. 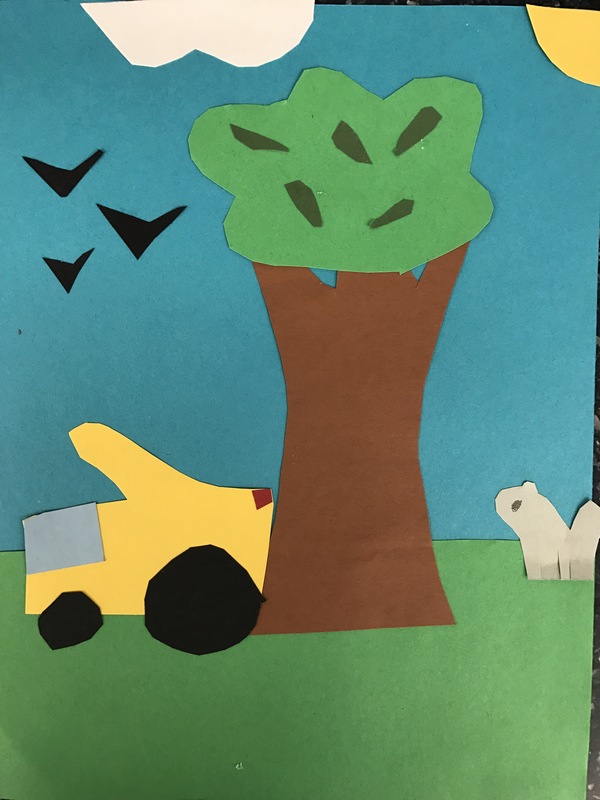 After two weeks working on their illustrations in and out of art class, I gave a brief introduction to Google Drawings. 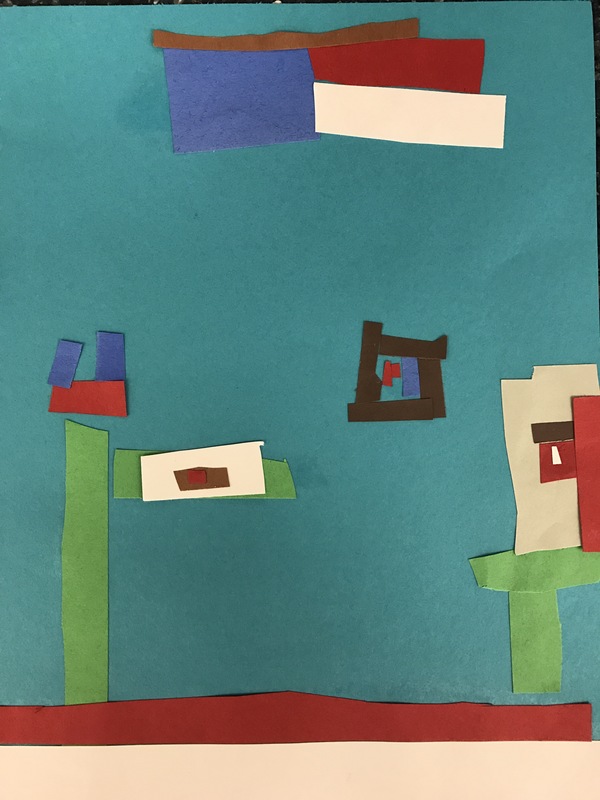 I created a blank 8.5 x 11 template and shared it via Google Classroom, then demonstrated how students could photograph and upload their image to Google Drive using an iPad, We then open the image in Google Drawings where they experimented with font style, color, size, and placement to complete their graphic design. 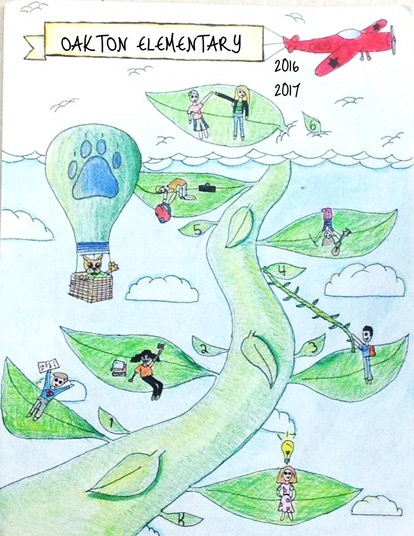 Students had one class period to make the final edits to their designs and submitted them to me digitally through Google Classroom. 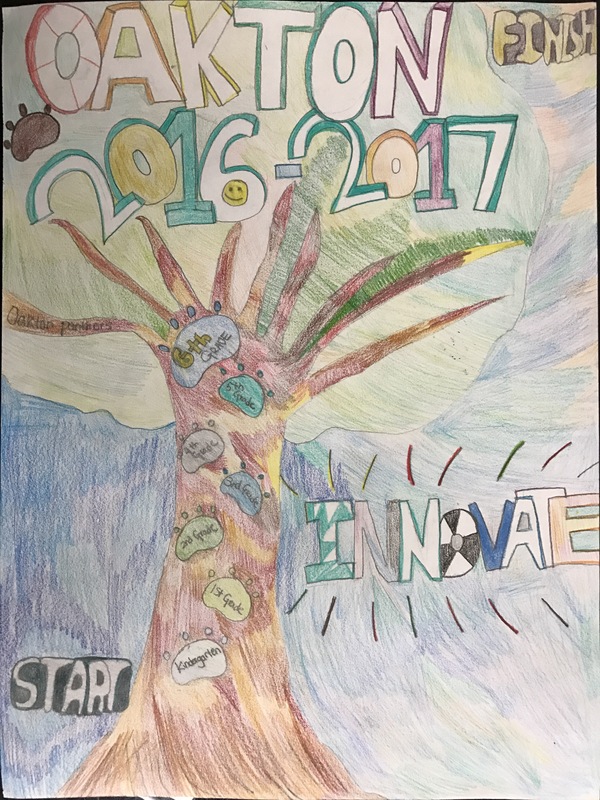 Five finalists were selected from each sixth grade class and submitted to the yearbook editor. These were then narrowed down to four back cover runners up and one front cover winner. 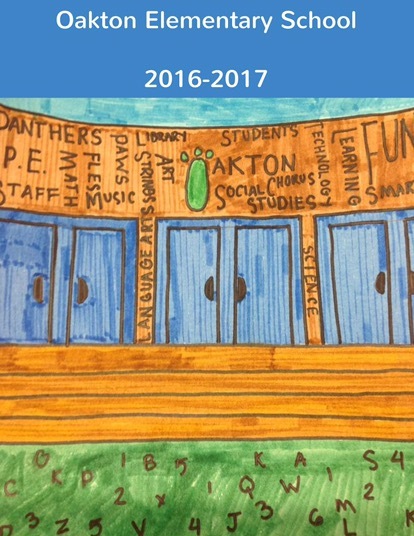 Additional images will be included throughout the pages of the finished yearbook. I was so proud of my students for their diligence and hard work throughout the project. I also felt proud to see how thoughtfully they engaged in the inquiry process to create unique solutions to the challenge. 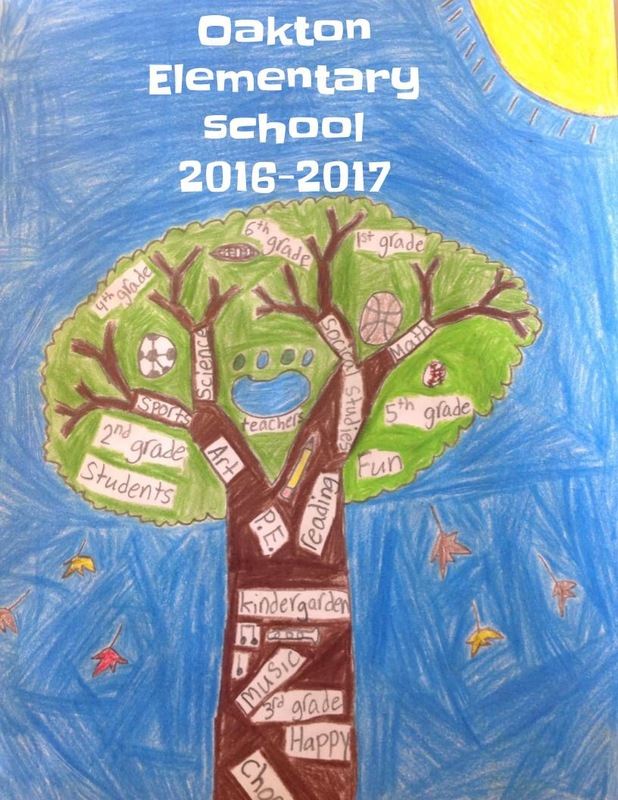 Students were proud of their fellow classmates and are excited to see the final outcome when they receive their printed yearbooks in the spring. 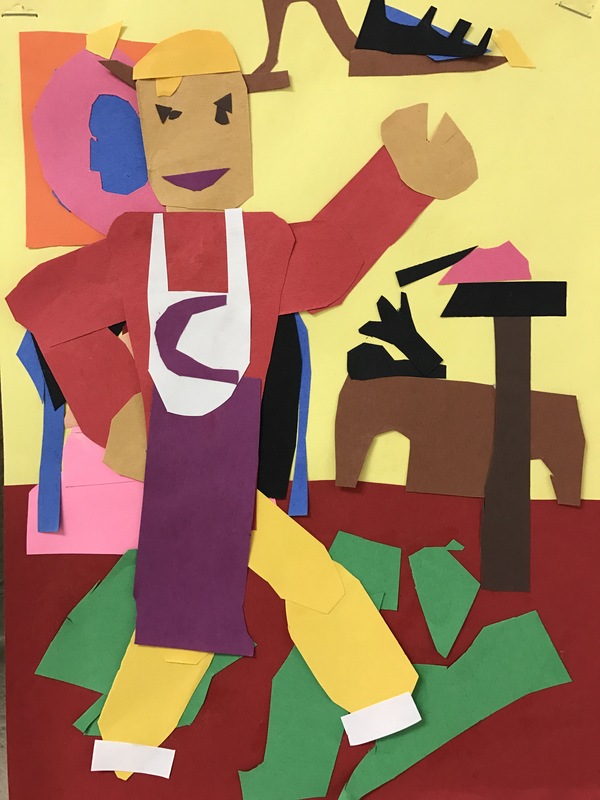 My second graders have been working on a collage that shows a community helper and where they work in our community. 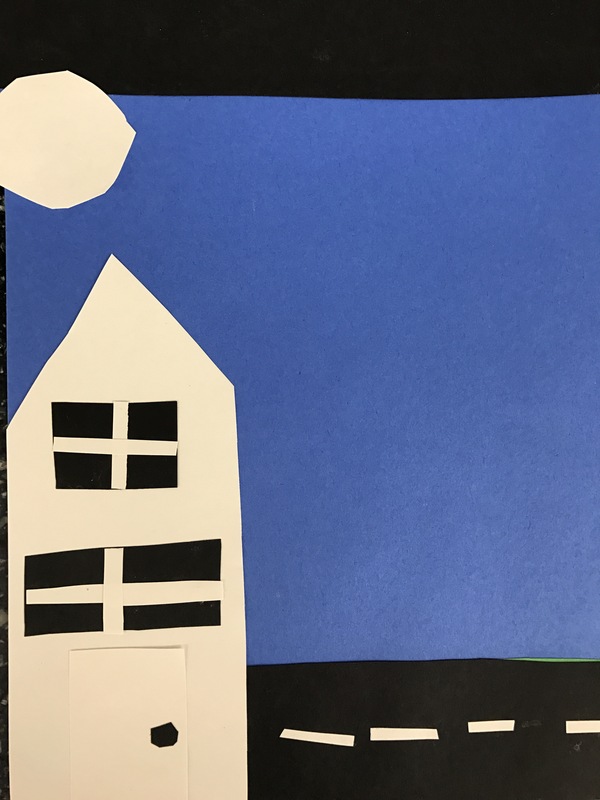 Last week we sketched, and today we created the background of our collages, which shows the place our selected community helper could be found. 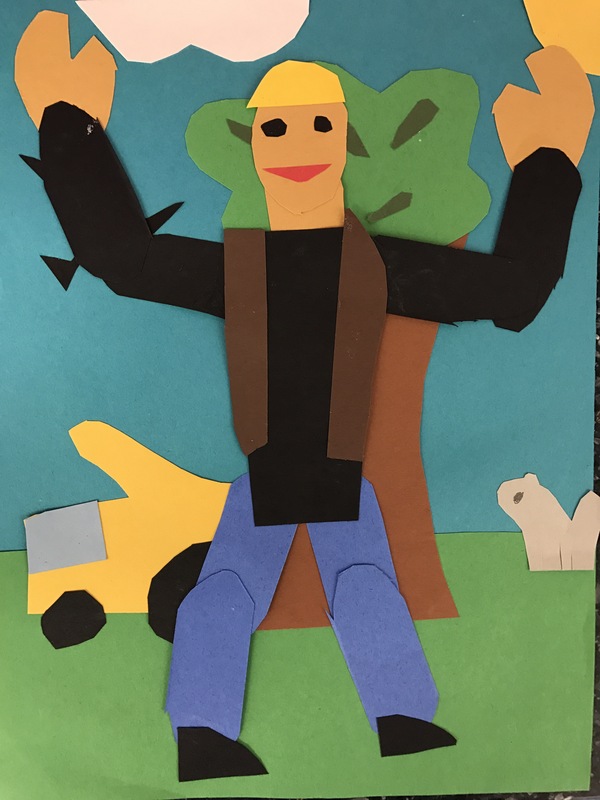 Can you guess which community helpers we will be making next week, based on their backgrounds? art teacher, mailman, pizza delivery person, librarian, office administrator, landscaper, librarian. 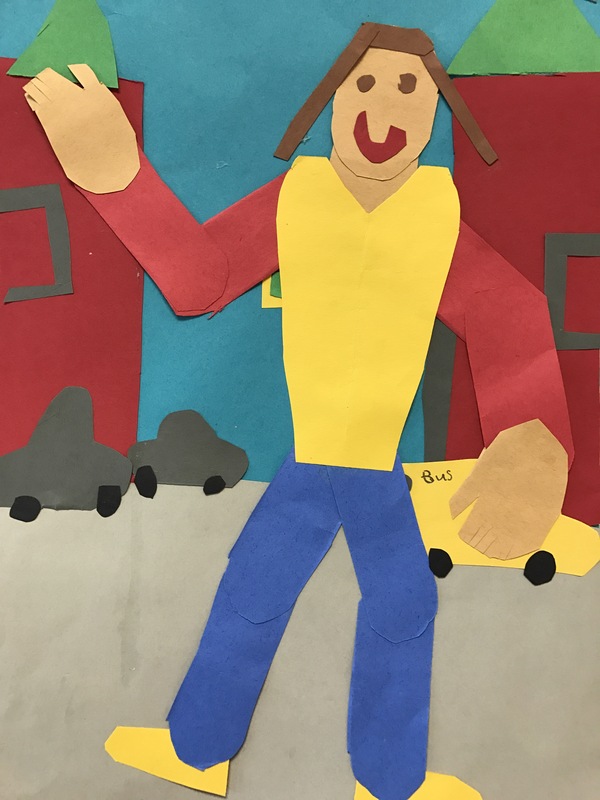 I am an elementary art teacher for grades K-6 in Northern Virginia. 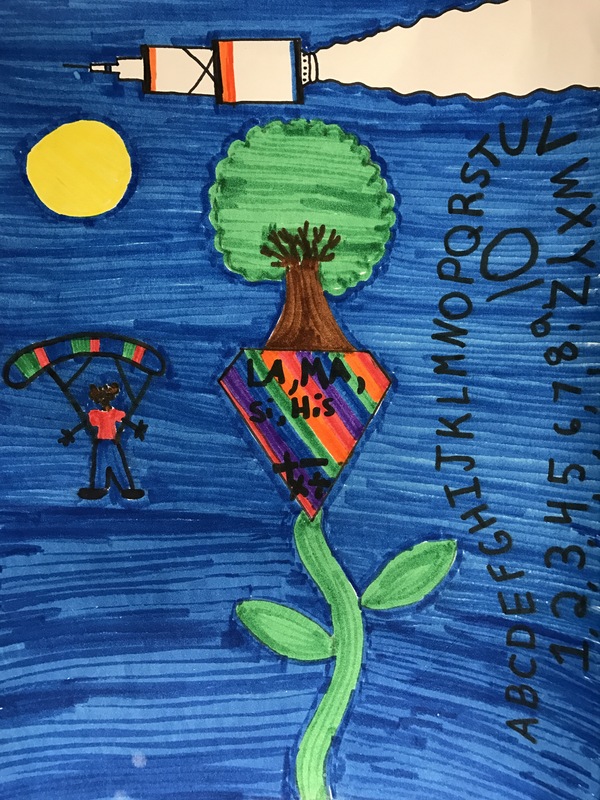 This blog is a collection of my thoughts on life as an art teacher.